If 2011 was the year of political demography, then 2012 was perhaps when the full intersection of natural resource management, population dynamics, development, and security came into focus. The U.S. drought; global food price spikes; the return of famine in the Sahel and Horn of Africa; continued unrest in youthful countries across the Middle East; the Rio+20 and London Family Planning summits; new oil and mineral development in unstable countries; and increasingly more noticeable climate change around the world – all were big stories that brought the intersection of these issues to the forefront. Thanks for your attention, feedback, and contributions throughout the year. We started a redesign process a year ago that finally finished this summer and we hope you enjoy the results. But if not, let us know! What do you think is missing from the blog? What were your favorite posts? 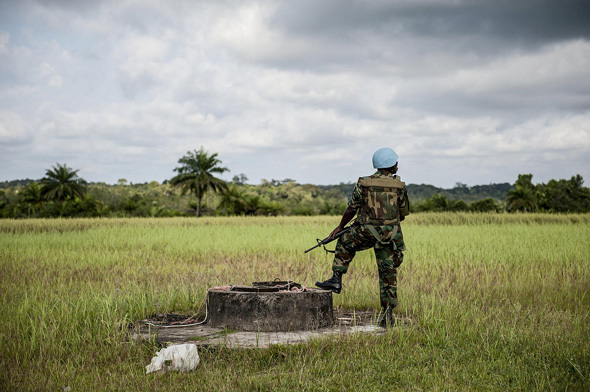 Photo Credit: “UN Peacekeeper on Duty in Liberia,” courtesy of the United Nations.